Courtney Grace...Love, Thoughts and Prayers: Lemonade Stand and Honeysuckle? One summer we decided to have a lemonade stand. We rode our bikes over to our neighbors house a few streets away, convinced that it would have more traffic and therefore customers. We made a full jug of lemonade and made a big sign that said "Lemonade 25 Cents." We were doing quite well, and had a steady stream of Fairway residents, joggers and mom's with strollers on walks. After a few hours (well, probably minutes...but we were young, so it seemed like hours) we made a crucial economic decision for our business. We agreed that selling lemonade was not good enough and we needed to expand. 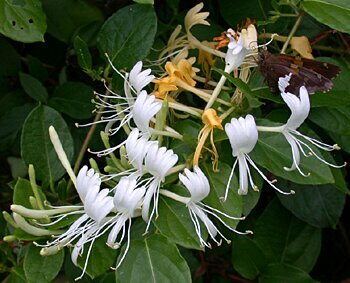 At this time we decided that a desirable product for our customers was honeysuckle. Yes, honeysuckle. We picked a ton of the little flowering plant and put it in a basket next to the lemonade. Whenever a customer came by we would demonstrate for them the proper technique for extracting the little dewdrop of honey and encouraged them to purchase a bundle of this "sweet treat" for a mere 10 cents. We were quite the business success story, and by late afternoon we were sold out of both lemonade and honeysuckle...the $7 we had made burning a hole in our pockets! I don't remember how we spent that $7 and some change but I do remember persuading customers to buy lemonade, with a side of none-other than honeysuckle....strange.